Baylor College of Medicine in Houston, Texas is home to the Human Genome Sequencing Center (HGSC), one of three federally funded sequencing centers in the US. One of the projects HGSC is involved with is the Cohorts for Heart and Aging Research in Genomic Epidemiology project (CHARGE), a consortium of more than 200 scientists across 5 institutions worldwide who are working to identify genes that contribute to aging and heart disease. The CHARGE project, which is an ongoing consortium, analyzes genetic samples and phenotype data from the National Heart, Lung, and Blood Institute’s (NHLBI) large cohort studies and similar studies in Europe. CHARGE and Baylor College of Medicine are collaborating to sequence many of the study participants and process them through Baylor’s Mercury analysis pipeline to help scientists to better understand how genetic variation could play a role in preventing and treating stroke and heart disease. Baylor has 20 sequencing machines that deliver some 24 terabases of content each month, about 1 PB of raw data. There are currently more than 14,000 participants in the study. The magnitude of the data resource requires innovative data solutions. DNAnexus offers data management, next-generation sequencing data analysis, and secure collaboration for DNA sequencing centers and researchers. DNAnexus’ services are provided through a single, unified system that scales to meet its clients’ unique academic or commercial needs. This unified system includes on-demand infrastructure for computation and storage, bioinformatics and cloud computing support, and secure, compliant collaboration, among many other features. The DNAnexus PaaS solution, which is built on Amazon Web Services (AWS), is being used by academic institution, governmental research labs, biopharmaceutical companies, and diagnostic test providers. Over the last century, a number of studies have followed patients throughout their lives to determine how people develop certain conditions or diseases. With the development of DNA sequencing tools, as well as the ability to manage vast sets of data, the results from these studies are now being re-analyzed as part of the CHARGE project. CHARGE scientists all over the world are making use of data to research the causes and prevention of disease. The infrastructural challenges alone were steep. “It takes a couple months to set up your infrastructure to cater to a particular need in terms of data storage and compute,” Veeraraghavan says. “In those months, technology can change, protocols can change, and updates to the sequencing platform can mean that sequencers can double their output. So demand has doubled in the time you’ve taken to plan and estimate your hardware needs.” Baylor also wanted scientists to be able to share tools across operating systems. Baylor needed a cost-efficient, easily maintainable solution that would enable it to provide safe, effective worldwide collaboration without delays caused by setting up a physical infrastructure. “We didn’t have months to spend on setting up an infrastructure, and we needed to be able to share the data efficiently, interactively, and securely,” Veeraraghavan says. Baylor decided to partner with DNAnexus, which provides an API-based PaaS that enables clinical and research enterprises to efficiently and securely move their analysis pipelines and data into the AWS Cloud. DNAnexus enables its clients to port their proprietary algorithms to the cloud alongside industry-recognized tools and reference resources to create customized workflows. The DNAnexus PaaS is built entirely on AWS, which has allowed DNAnexus to scale its system to more than 20,000 simultaneous compute cores, 1 PB of storage, millions of core hours of analysis, and hundreds of thousands of compute jobs orchestrated in the AWS Cloud. AWS has also provided DNAnexus with a Business Associates Agreement (BAA), allowing DNAnexus to offer best-in-class security and compliance with healthcare laws both in the US and internationally. Using AWS, customers can build and run HIPAA-compliant workloads. The CHARGE project uses Baylor’s analysis pipeline, Mercury, to process its data. The Mercury pipeline consumes raw files from the sequencer and transforms that data into the end deliverable: an annotated variant call file, identifying mutations that could be of clinical significance. Scientists downstream perform tertiary analysis to tackle additional research questions. A small group of researchers are developing tools that look closer at the biology of each genetic marker, so that they can reprocess the data with new findings about both predictive and protective genes. Researchers can compare different tools and share them across geographical boundaries using the DNAnexus platform. DNAnexus uses Amazon Simple Storage Service (Amazon S3) and Amazon Glacier to store more than 1 PB of genomic data. DNAnexus created a command-line tool that gives scientists the option to upload DNA data directly from the sequencing instrument to the cloud, thus eliminating the need for costly on-premises storage infrastructure. 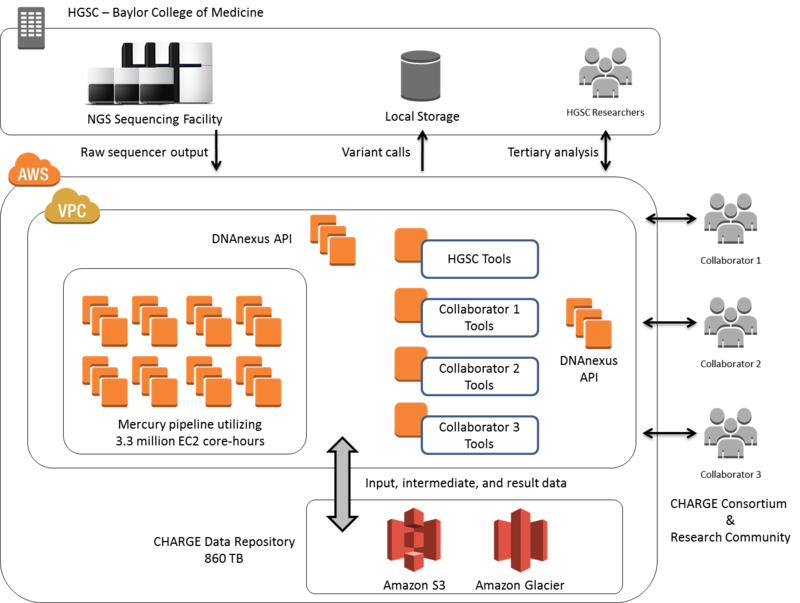 Amazon Elastic Compute Cloud (Amazon EC2) hosts the DNA analysis itself. DNAnexus developed a custom queuing system that operates on Amazon EC2 instances, which is designed to handle interruptions in data processing. To optimize costs, DNAnexus uses Amazon EC2 Reserved Instances for its interactive services, such as its website, customer front-end portal, and DNA visualization tools, as well as for its back-end cloud and job management services. To learn more about genomics in the cloud, visit the AWS Genomics details page.